Good finish position, Bad finish position. I told my morning class yesterday that we respect and admire gymnasts because of their control. At all times, no matter their body position or leverage in time and space, they have near absolute command of every fiber of their body from fingertips to toes. 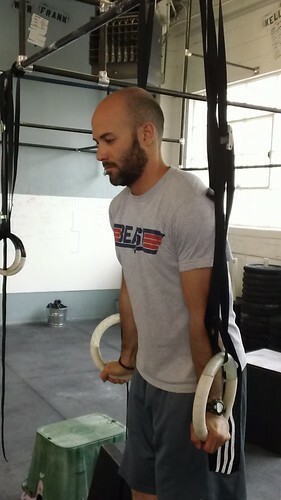 Without fail, any gymnast who tries CrossFit is the fastest learner of all others. 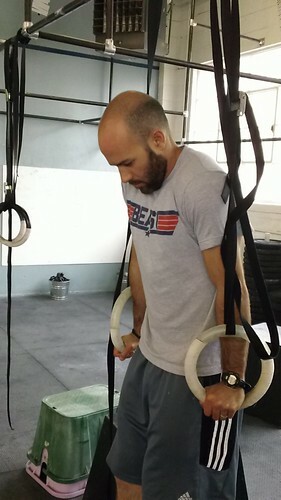 We give our athletes so much time on the gymnastic warm ups simply because it takes time to develop the prerequisite strength and sheer body control for even basic movements. Rest assured, how you practice is how you perform, and we want you to aim for perfection in movement! Look at Diso’s two finishing positions for the ring dip. The ‘good’ has him actively pushing the rings down away from him, with wrists turned out to guarantee a complete lockout of the elbows. Whereas the ‘bad’ has lazy shoulders and poor lockout. There are websites we all check daily besides PCF (and we KNOW you all check this website daily, right?! ), usually for work or entertainment or both. I should like to ask which other non-CF related sites you check regularly, as an attempt to get to know The Other You. I’m a huge nerd (shocker I know) and I love movies so www.comingsoon.net is something I check in on several times a day. I haven’t found one so rich in new updates on upcoming flicks, horror flicks, comic news, featurettes, interviews, links, all in the same place. Yes it’s only one site but the other 6 to 10 sites I check are all CrossFit related, so let’s hear what some of you guys have. And please keep it clean; we have a CF Kid’s program now. Go!